It’s the start of a new year and I know you’ve got some new ideas for your, business, project or community. We all have the potential to lead change, but society, systems, and we ourselves suppress our courageous ideas. We exaggerate the risks and often don’t have the courage to take the bold steps we could. Don’t fall into this trap this year. This is the time for women to creatively solve the world’s problems. In her speech at the 28th World YWCA Council, UN Women Executive Director Phumzile Mlambo-Ngcuka called for more “business UNusual”–bold and transformative leadership from women. This is the time for women to creatively solve the world’s problems. As you begin to envision your ideas for the year, do you start censoring yourself? Do you anticipate that when you pitch the idea to your friends, family, or coworkers that you must minimize it or that they will not take you seriously? Whatever unfounded fears might try to stop you, courage is a tool you have that can help you move ahead. Courage is acting despite our fears, knowing that what we want may not work or that we will face opposition but acting any way. For the courageous, belief in their vision is worth the temporary difficulties along the way. Courage is acting despite our fears. Our actions may not necessarily eliminate the obstacles, but every time we choose to press into an uncertain next step, we choose to make our vision bigger than any obstacle in our way. A key way to cultivate courage is to surround yourself with people who are also cultivating their visions and pressing forward to a better future. There are women around the world just like you who are pushing the status quo and making bold choices every day. Connect with them by expanding your network to include organizations around the world like these. Talk to courageous people in your network about your ideas, seek out the resources that will support not thwart you. The more you voice your big ambitions, the more you put your intention out there, the more you and others will hold you accountable for achieving what you envision. Think back to your new idea. If you are honest with yourself, likely you have some thoughts about how you can accomplish it. If its not knowledge or resources you are missing, then perhaps what’s lacking is the courage to push past the status quo – the boldness to act. 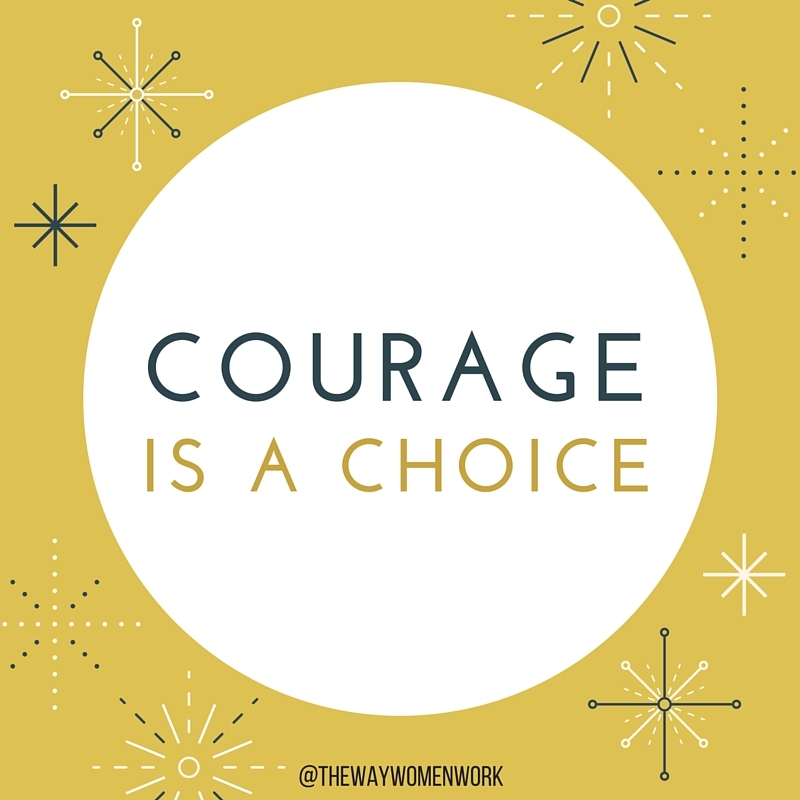 Courage is a choice. I interviewed hundreds of courageous women like you in Asia, Africa, Eastern Europe, Latin America and the Middle East when I wrote UNDETERRED and I meet more and more of them every day. I know that the most difficult global issues of our time can only be addressed when women are fully engaged along with men to find solutions. Each move we make to push past our fears we will be one step closer to creating the beautiful world we envision.